Successfully Added IP Security Camera with CF Card Slot and LCD Display (Pan and Tilt Angle Control) to your Shopping Cart. Say hello to this awesome IP Security Camera which comes with powerful software for remote pan and tilt angle control, CF card slot for instant picture, LCD screen for displaying IP address, and a variety of other cool new features to safeguard your home or business. Fast, Responsive Angle Control Like No Other: Like a robot anchored in your home, this camera will show your home from every angle even when you are thousands of miles away. Simply install the software, you will be able to rotate the camera 120 degree vertically and 180 degree horizontally, giving you a full view of every detail in your home or business. Furthermore, unlike other cameras with pan and tilt control, this one is highly responsive no matter how far you are away. Global Surveillance from Anywhere in the World: The software can let you do much more. You can install as many as 16 cameras and display them simultaneously on your screen and control them wherever you are in the world. With the global access of these IP surveillance cameras, you can be on a business trip in Hong Kong and watch your backyard in London! No more worrying about home or office security, because now you can have eyes everywhere. Now offered at an unbelievable low wholesale price, this product is in stock for immediate shipment worldwide. It even comes with our famous 12 month product warranty. Order now and your order will get shipped within a day. Brought to you by your source for direct from factory electronics, Chinavasion. Recording camera output is done through the software or IE browser. Simply install the software on disk and it will add viewing and recording functionality to your browser. 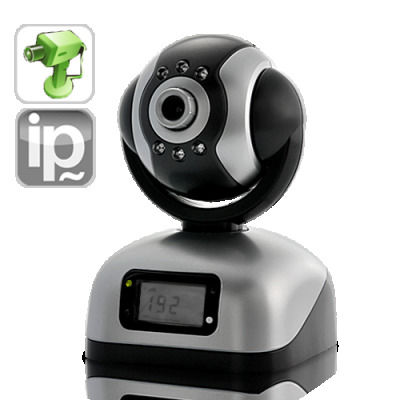 Comes with powerful software to view and control 16 cameras simultaneously. Cute look as a mini robot. on 2012-05-19 00:33:57 Very nice product! This is a really nice camera! It works very well, its cheap, the picture quality is not so bad. But what can you expect from the price? I am very satisfied with this! Its perfectly good to watch wherever you want. And ofcours, it was shipped to Norway in 4 days! Great!